Whether you're entertaining a large group for dinner or just whipping yourself up something quick after a long day, the first step towards ensuring that meal is delicious is choosing the right tools to work with. The knives you use can make all the difference when it comes down to your food cooking evenly and well — and this SmartPan 3-Piece Knife Set is exactly what you need to upgrade your kitchen accessories and start executing the recipes you want. 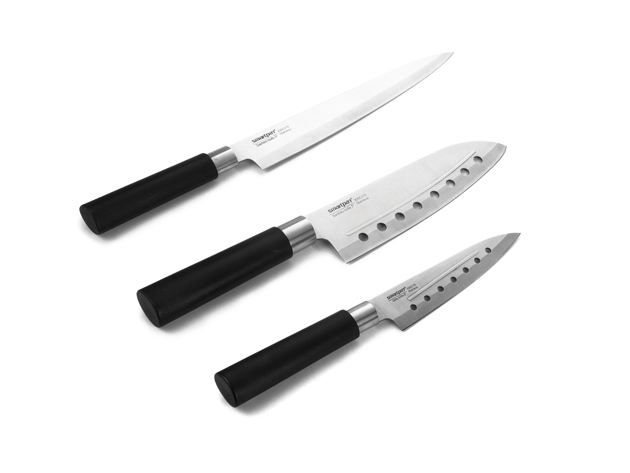 This 3-piece set from SmartPan includes a carving knife, santoku knife and utility knife — this collection of cutlery gives you the flexibility you want to cook the meals you have in mind. If you're working with fish, the carving knife features a narrow blade that's perfect for dealing with the delicate flesh and small bones — if you're planning to cook with meat, the santoku knife is perforated, so the meat won't stick to the blade as you're butchering. When it comes to working with produce, it's the utility knife that'll be your best bet, featuring a short, nimble blade to make efficient, clean work of chopping up your fruits and vegetables. Stop ordering out and start cooking more: usually, this SmartPan 3-Piece Knife Set is $39.99, but you can get it here for $19.99. Want your products featured in the Salon shop? Learn more about how to sell your products online!